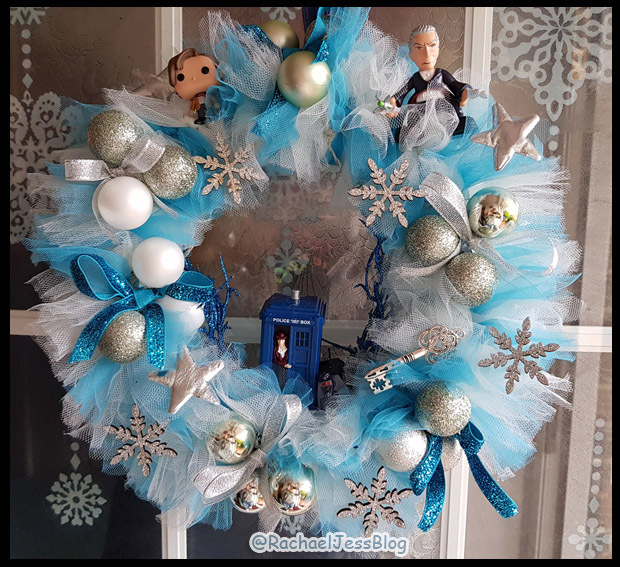 After making Halloween wreaths last year and thoroughly enjoying myself, I decided to make a Christmas wreath this year, and you just know it's not going to have standard Chrismas decorations on it! 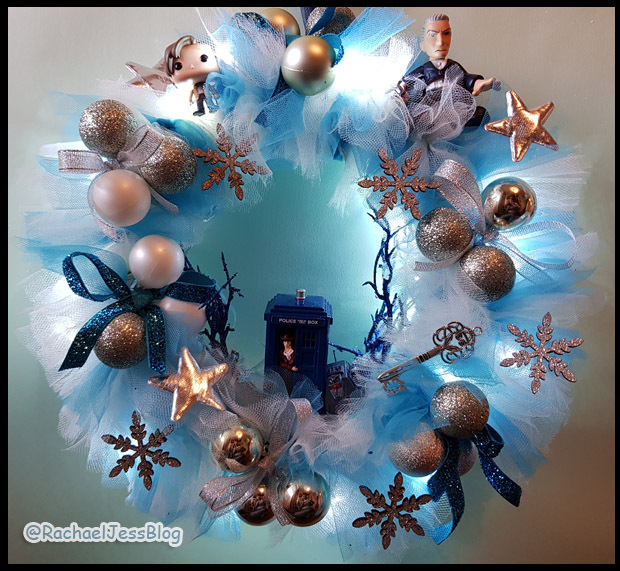 I started with a polystyrene wreath from Hobbycraft and blue and white tulle rolls that I picked up off eBay in a stock clearance section (at that point I thought I might want them for the school fair, but we made a fireplace instead). 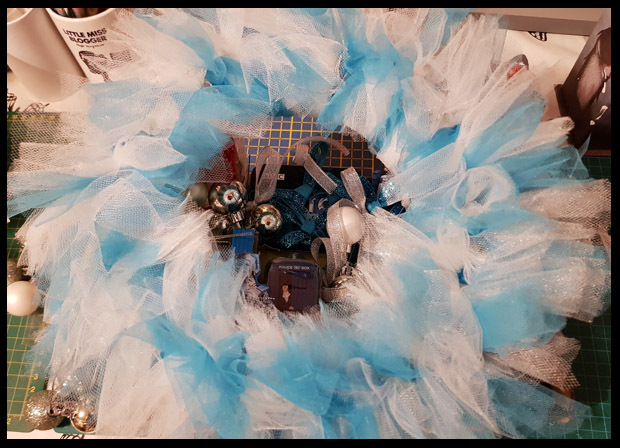 I cut and wrapped the tulle fabric around the wreath and this is slightly time-consuming, but you have to admit the end result is worth it. What I will do the next time I make a wreath is to wrap the fairy lights around first, THEN add the fabric. As you may have guessed it was only after I'd completely covered the wreath that I decided to add fairy lights! Bit of a faff if I'm honest, and I used the green wreath sticks that I got from Hobbycraft to pin the light wires down. Once the fabric was trimmed and the lights were in place it was ready for my favourite part! 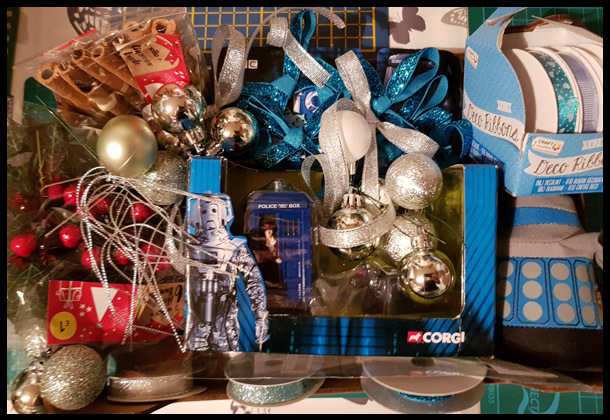 I bought some small baubles which I tied together in groups of three, turned glitter ribbons into bows and the most important part sourcing Dr Who accessories! Armed with my glue gun I set about adding the accessories around my wreath, and that's it, just add as much or as little as you want. If you're not sure on what decorations to add then you could pop down to your local Hobbycraft as I found they have a great section on accessories for wreaths. You know, this is not coming down after Christmas! I may move it to my craft room, but I don't think I could banish it to the loft for 11 months! This looks amazing. My boys are huge Dr Who fans, so we were glued to the screen on Xmas Day. Me too. I think I'm going to love the new Dr. And cosplay !!! !